In 1844, William Law, a disaffected Mormon, published a paper full of slander aimed at the Prophet Joseph Smith, even calling for Smith to be arrested and hung. The Nauvoo city council authorized the destruction of the printing press. Non-Mormon neighbors were incensed and a riot followed. 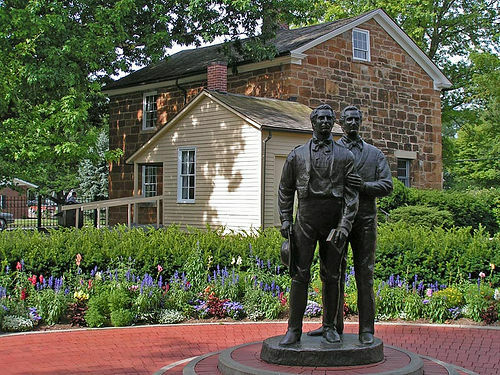 Joseph Smith, Hyrum Smith and others were arrested for inciting the riot. The governor promised the men that if they submitted to the arrest and went to jail in Carthage, he would protect them. The men agreed to go to jail and undergo a trial. While in Carthage, Joseph was threatened numerous times. On the morning of June 27, 1844, while at Carthage Jail, Joseph wrote a letter to his wife, Emma, "I am very much resigned to my lot, knowing I am justified, and hove done the best that could be done. Give my love to the children and all my friends ... May God bless you all" (History of the Church 6:605). ‘Of me thou hast not been ashamed. Fear not, thou didst them unto me. Shortly after 5:00 in the afternoon, a mob of 100 men with blackened faces for disguise, headed for Carthage, stormed the jail, and began firing through the door. Hyrum was shot in the face. Joseph leaned over his brother and exclaimed, “Oh dear, brother Hyrum!” Joseph fired three shots through the door at the mob. John Taylor attempted to leave through the window, but was hit a number of times. One shot hit his pocket watch, another his wrist, another his left knee, and a final shot hit his left hip. Joseph Smith went to the window, knowing that there was no safety in staying in the room. He was shot from outside, and killed, his body falling through the window. Willard Richards, who had been told by the Prophet that he would be safe, luckily only had his ear slightly grazed. The mob ran outside to make sure Joseph was dead. Fearing the mob would return, Willard Richards hid John Taylor, who was still alive. The mob did not return. Joseph Smith’s brother Samuel had heard about the threats on Joseph’s life and was on his way to Carthage. He arrived that same evening and was the one who wrote the letter back to Nauvoo telling the Saints that their prophet and his brother Hyrum were dead. Carthage Jail was used as a jail for 25 years before being converted into a home. The Church bought the building and property in 1903 for $4,000. Joseph F. Smith (son of Hyrum Smith) was President at the time it was purchased. The Church did not start to restore it until 1938. It is now open for tours. This page was last edited on 30 August 2011, at 10:22.